Please accept my apologies for the lack of attention I’ve given the blog over the last month or more. It’s been an interesting March/April. Over the last month I’ve ran a half marathon (whilst on a vegan diet) and Jackie and I have decided that were packing our bags and moving to Tennessee! Jackie will be pursuing a Masters degree, and I will be transferring to the Whole Foods in Nashville. With the decision to move, has come a lot of devotion to finding a place to live as well as attempting to find a job for Jackie, amongst a myriad of other moving details. Hence the absence from the interwebs. 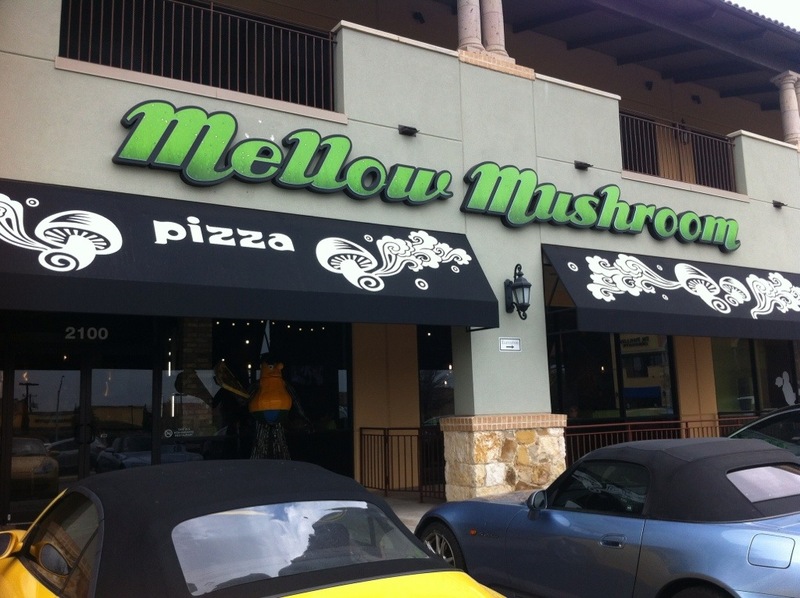 Over the last month we’ve had some great new vegan meals and found some neat vegan options at local restaurants including one called the Mellow Mushroom. They’re fairly new to SA, but have locations across the continental US. Their menu is primarily pizzas and sandwiches, but they are also know for a decent selection of brews. In early March we made a stop in and had a run at their menu. Though not super vegan friendly, they do offer Daiya cheese and other options on their pizzas and wiches. 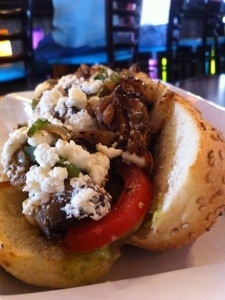 I took a big leap and had their equivalent to a Philly Cheesesteak: a marinated seitan sandwich with grilled peppers and onions, topped with feta cheese. I wanted to have the Daiya cheese, but seriously forgot to ask which was a big mistake, because our waiter made less than frequent rounds to see how we were doing. Regardless, the sandwich was tasty and super filling. Take a look at their website and see if there is a location near you. Once again, sorry for the absence, but hopefully we’ll be back at blogging a little more frequently.